Artist: Heather Villanueva is a queer filipino american social justice activist working the labor movement as a community organizer in Seattle, WA. 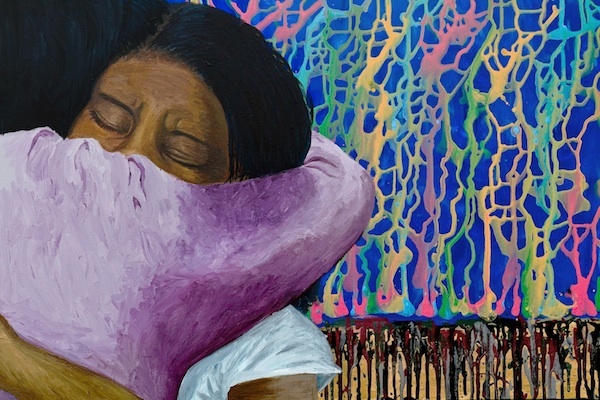 Description: The two people hugging represents a moment between two people whether they are being reunited after years or are about to be separated as a result of deportation. It is a moment of both pain and profound strength, when you wish with all your heart that the love you feel for the other person was stronger than the forces of that keep people apart. It is the moment that you know that you will do whatever it takes to be together again someday. Love anchors our hearts to one another, binds us to the truth, and drives us to pursue justice. If only love was enough to heal the scars that have been stapled across the land – fences guarded with hate and disdain, dripping with forced sacrifice and unchecked greed. Beautiful new shades would arise as myriad hues of ideas and imagination mix, bearing witness to a future where all people are valued. Together we must make this dream a reality. Not1More deportation.